I was really happy to see White Rabbits listed on the bill with Interpol. I've seen over 50 bands this year and White Rabbits are still one of my favorites. Their music has a certain character, some of which I attribute to Stephen Patterson's gutsy vocals and percussive piano playing; and some of which I attribute to the band's overall percussive sound and unique harmonies. Friday night was my second time seeing White Rabbits. They were just as focused and hard hitting, opening up for Interpol as they were headlining at Bowery Ballroom. I saw a few people seated around me who were hearing the band for the first time and really enjoying them. In fact, the woman behind me tapped me on the shoulder to ask the band's name. White Rabbits really made some great music on Friday night. My friend, who never heard them before, thought so as well. As flood lights flickered from above, White Rabbits walked on stage to loud industrial sounding noise. The noise effectively demanded immediate attention but I could have done without it. The noise thing happened again in the middle of White Rabbits set. It was a different noise, but it still gave me that same "why am I listening to this noise that sounds like it has nothing to do with anything" feeling. Aside from my disliking the loud industrial sounding noise, from the first song on, I thought band cooked. It didn't take long to remember how much I loved watching both drummers, especially Matthew Clark who plays percussion with manic intensity and also fills in by playing an instrumental part here and there. For example, Clark hyper-actively walked back and forth, behind Patterson, playing tambourine while Gregory Roberts sang most of the vocals for the "The Plot." At a point when Patterson was busy playing piano, Clark leaned over and played the right hand register of the keyboard on top of Patterson's upright piano. The overall sound for White Rabbits set was actually pretty good. From where I was seated in the balcony, there seemed to be some echo which was mainly due to the size of the hall. However, the piano seemed more audible this time round than it sounded when I saw White Rabbits at Bowery Ballroom. For lack of a better way to describe it, the first new song White Rabbits played was kind of Jan Hammer meets Fat Boy Slim. The new song's sequenced underpinning seemed very "Theme from Miami Vice," while something about the chord progression reminded me of Fatboy Slim's "Praise You." However there was much more to song such as it's consistent drum beat and harmonized vocals by Even, Patterson and Roberts. The 2nd new song started with a cool but hauntingly rhythmic bass line that Brian Betancourt plucked out with a pick and played through the entire song. Alexander Even and Gregory Roberts played sparse guitar parts until end of the song when they joined in on the line Betancourt was playing. Patterson handled the vocals and sang mostly in his falsetto voice. The song had in intriguing and mysterious quality to it which I enjoyed. White Rabbits immediately followed the 2nd new song with another. It started (and ended) with just drums, then Patterson came in with a percussive piano part and his vocals. What seemed to be a musical hook was played on guitar by Roberts and Even. To clarify, it seemed like each time the same descending melodic guitar line came round it was answered by Patterson's vocals, making it the most memorable of the 3 new songs. White Rabbits ended their set with "Kid On My Shoulders" and "Percussion Gun," which were the two songs I was waiting for other than "Company I Keep." Except for the noise portions of their set, I'm still diggin' the White Rabbits and if they have a new CD in the coming year, I plan on seeing them again. For the past month, I have been listening to all of Interpol's music in preparation for Friday night's concert. It wasn't really difficult to acquaint myself with their catalog. I already knew some of their songs and was familiar with their sound. Of course, there were those songs I didn't know but even some of those soon became favorites. After a small amount of preparation, I was really ready to totally love Interpol's performance on Friday night. Unfortunately, I enjoyed parts of Interpol's set but I can't say that I loved it in it's entirety. In terms of the bands musicianship and sound, I have no complaints; the band was great. But as for presentation with regard to song choices and aesthetics - Interpol's performance was dull. Interpol did 15 songs within the same tempo range which by mid set made each song sound the same as the next. There was a song here and there like "Rest my Chemistry" that felt like a small departure but for the most part the sameness remained. A ballad like "NYC," which was not included in the New York show, would have made the Interpol's set more interesting. But it seemed to me like the entire set, of 15 fast guitar driven songs, was strung together without any intended arch, flow or musical journey. 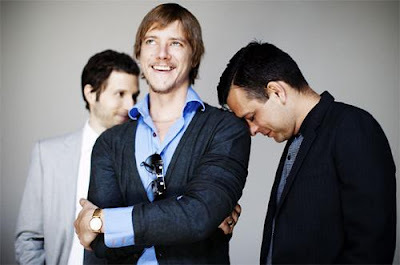 When Interpol returned with their 3 song encore, they started with the ballad " The Lighthouse" By virtue of being mostly just Daniel Kessler on guitar and Paul Banks on vocals, the song should have been included in the set and not the encore. If an audience is clamoring for an encore, an ethereal ballad is not something we generally want to hear. When I saw Phoenix two weeks ago, the band totally made it clear that they were playing Madison Square Garden and that they were going to make total use of the space. I may have felt the show got a little too busy at times but it still was a show that kept people way up in the blue seats interested. The set Interpol did would have been okay at a smaller venue like The Bowery Ballroom but not so much at The United Palace Theater. The theater is a big place. Therefore, if there is not much movement on stage - whatever is on stage becomes visually boring. The only real movement that was happening on stage was by Daniel Kessler dancing around with guitar in hand, everyone else seemed stationary. Since there are now only 3 Interpol members and drummer Sam Fogarino is one of them, I don't understand why he was in the dark for mostly all of the show. There is one thing I found oddly funny. Interpol performed "Not Even Jail" then Banks said "that was our last song." It kind of had the feeling of "okay we're done - goodbye!" I wasn't offended but it was sort of rude. However, the audience didn't seem to mind. They even applauded a little longer than usual for Interpol to return for the encore. So, I guess the deal is that Interpol is the kind of live band that simply runs down a list of their songs. In concert, Interpol's arrangements are the same as their recordings and their tempos are consistently fast. Put plainly, the band doesn't take many (if any) risks. That's cool. I will still listen to their recordings but as for their concerts - I think next time I'll pass. Umm... Sam Fogarino is the drummer and Daniel Kessler is the guitar player. To the person who left the previous comment. Thanks for reading my review and the pointing out the mistake, it is appreciated - I noted the correction.